Mice breathe at three speeds. At rest, they breathe at ~3Hz. When they smell something interesting, they start rapid-sniffing at ~8Hz. And when mice encounter something malodorous, they hold their breath, and but still breathe every second. Given the differences between these breathing regimes, how can the olfactory system encode odor information across all cases? The best attempt to address this question was by Cury and Uchida (although credit should be given to Verhagen and Wachowiak for the first crack). Cury recorded from mitral cells in freely moving rats while the rats performed odor tasks. During the tasks, the rats switched between normal and fast-breathing, which allowed Cury to compare the neurons' firing during both conditions. 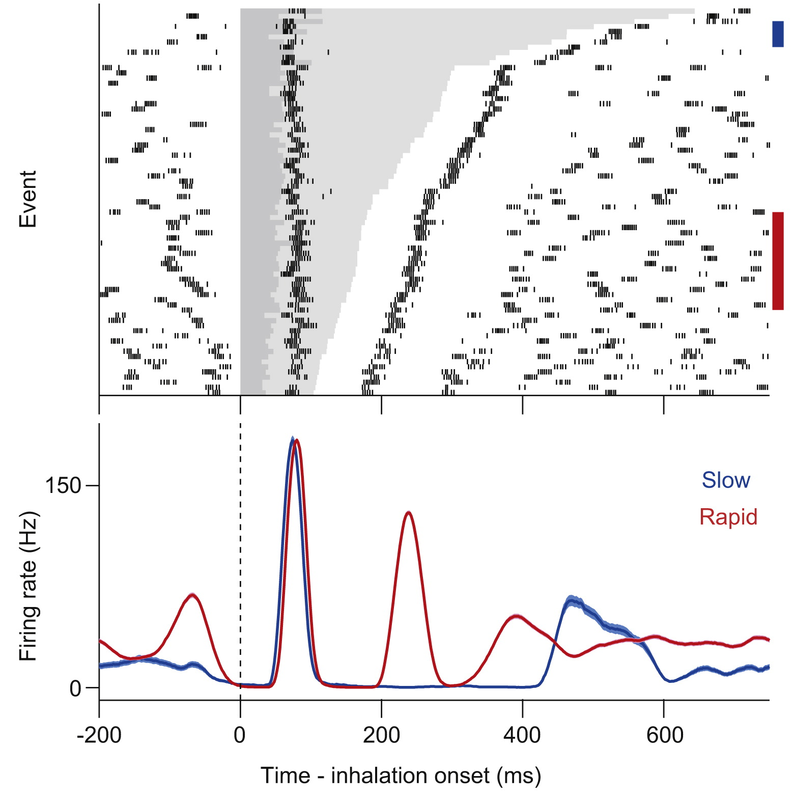 They found that the spike timing (or odor code) does not depend on the duration of the breath length (see below; similar to what I blogged about, arguing against a phase-mapping of the sniff cycle). They also noted that during fast breathing, there could be hysteresis, where activity during one breath bleeds into the next. Response of a mitral cell during breaths of different duration. Top. Raster plot of a neuron's spikes, aligned to breath onset. Inhalation is show as dark grey area, and full breath in light grey. Bottom. PETH of firing during breath during rapid and slow breathing. Note, there is no odor present, but the result holds for odor responses as well. From Cury and Uchida, 2010. Seeing this, they turned to the population, and asked how the odor information evolved over the course of one breath. They calculated the population spike distance between different odors, and found that for both fast and slow breathing, the odor representations started to diverge 40ms following inspiration, and were maximally separate around 50-80ms. Following the peak, the representations "converged" (is there a word for "move closer together, but not bunched"?) for the rest of the breathing cycle. Notably, there is only a small difference between fast and slow breathing in the amount or speed of information . 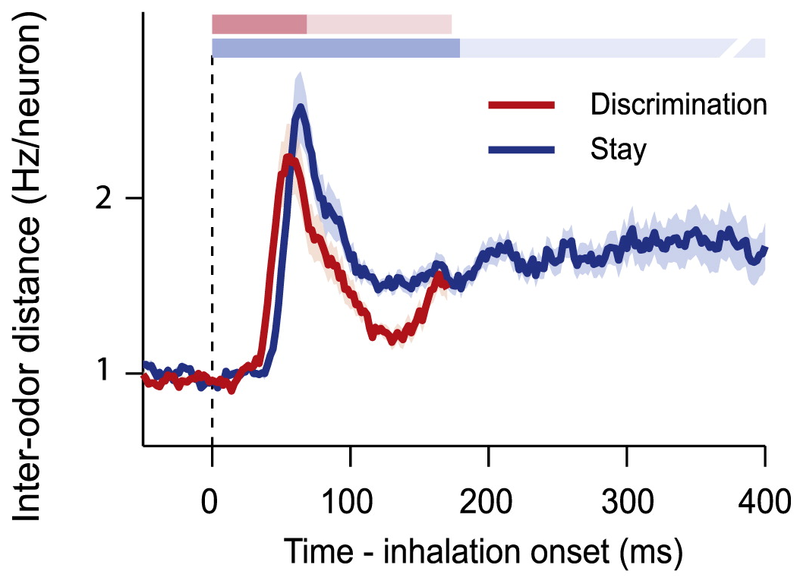 Population spike distance ("inter-odor distance") for fast ("discrimination") and slow ("stay") breathing regimes. The distance peaks between 50-80ms before plateauing for the rest of the breath. This timecourse of the distance is reminiscent of structural plasticity following uncaging. Given these results, what is the role of fast sniffing? Rodents fast-sniff when they encounter a novel odor, or when they are searching for an odor source. People have hypothesized that fast-sniffing might give more information about the odor. However, the data above argue that there is no more information during fast-sniffing than slow. Rather than more information during a breath, fast-sniffing may provide a more frequent sampling of the environment. In the discussion, Cury and Uchida also note the robustness of the odor coding across different breathing regimes. 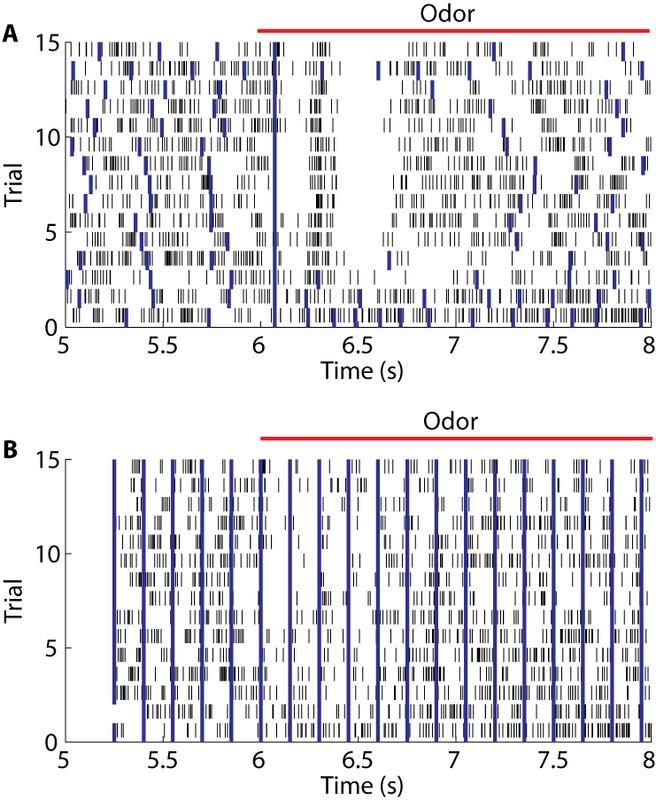 This means the odor code is invariant with respect to inhalation amplitude or duration. 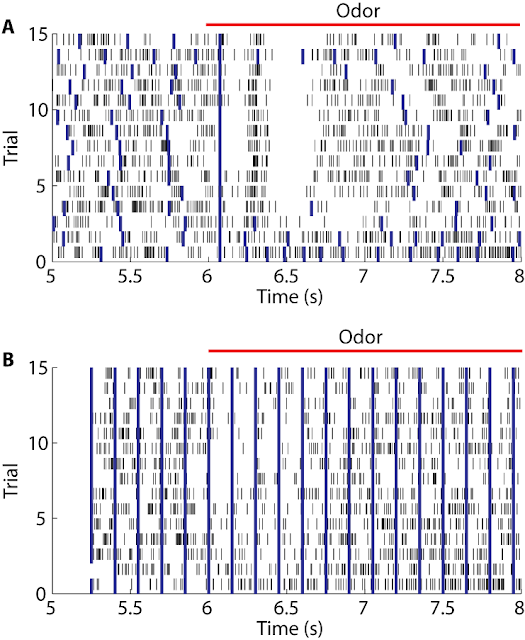 In another part of their paper they look at how behaviour relates to odor coding, and found that the responses are relatively insensitive to top-down processing like attention as well. 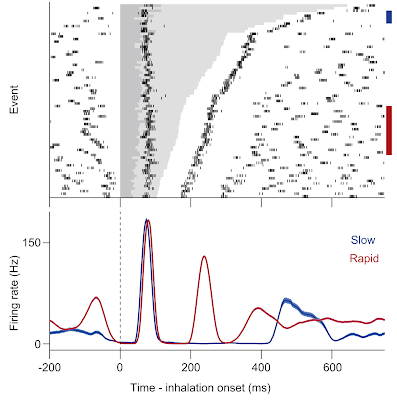 While Cury and Uchida showed that the first 150ms of odor coding during fast and slow breath are the same, it still leaves the question of why so many cells respond after 150ms. For example, the cell below responds to an odor by firing a burst of action potentials at XXXms (top panel below). However, when the mouse fast-breathes during the early trials, this odor response does not have time to evolve. This can be clearly seen if you truncate and aligned all responses to a 150ms window (lower panel). Raster plot of a cell's response to 3-Hexanone. Spikes shown in black, and inspiration in blue. Odor presented from 6-8s. A. With only the first respiration aligned, you can see a clear response to the odor approximately 200-300ms following inspiration. After the burst of activity, the cell is inhibited again, then returns to basal firing before the next breath. During the first two trials, the mouse breaths faster, and there is no odor response. B. Same response, with each breath truncated to 150ms, as if the mouse were fast-sniffing. The response is no longer evident. The cell above also shows what happens to the odor code when the animal stops breathing. The cell above is inhibited after its burst of spikes, but the inhibition only last ~500ms. Afterwards, it just returns to its basal firing rate. In other words, the odor code only seems to exist for 500ms. It is easy to sense this perceptually: if you sniff something and then hold your breath, the sensation dissipates rapidly. So, why do many mitral cells only respond to odors after 150ms, which is after the subject has identified the odor? I have two hypotheses. Hypothesis 1 (why? ): The slow breaths do contain more odor information overall, which is contained in the spikes later in the breath. 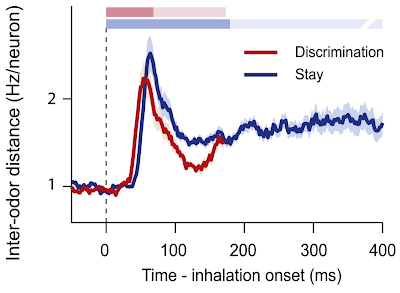 In another figure of the paper, Cury and Uchida show that their odor predictor monotonically increases its accuracy over the entire breathing cycle. However, behavioural data argues against this: when rodents are performing a freely moving odor discrimination task, they fast-sniff. To test this hypothesis, you could measure a subject's odor discrimination or detection thresholds while it employs a fast- or slow-breathing strategy. If the slow-breathing threshold is lower, it would imply that the late spikes add information. However, if the thresholds are the same (or fast-sniffing lower), then it would argue against the information hypothesis. In the end, this may be difficult to test in rodents, as you need to force them to employ a specific breathing strategy. Hypothesis 2 (how? ): The responses after 150ms are vestigial, due to continued ORN input, or reverberations in the olfactory bulb. ORNs can have complex temporal responses that last for seconds. It is possible that they continue feeding odor-specific information to the olfactoroy bulb after the olfactory bulb no longer needs it. This input would manifest itself as late-arriving responses. Another possibility is that the olfactory bulb contains recurrent connections, like dendro-dendritic inhibition, that allow the structure to reverberate. For example, stimulating the olfactory nerve can cause mitral cell activity that lasts for seconds. The mitral cells may already have all the information they need after 150ms, but continue firing due to these reverberations. This hypothesis is more easily testable. You can record from mitral cells in OMP-Halorhodopsin mice. Then during each sniff, you can turn on the light after 150ms, shutting down ORN input to the mitral cells. If the mitral cell activity is elided, then they require ORN input to continuously fire; if, however, the mitral cells continue to fire, then the ORN input is not needed.